There are landmarks that seem to be iconic, such as the Ship Hotel, others seems to silently fade from memory. 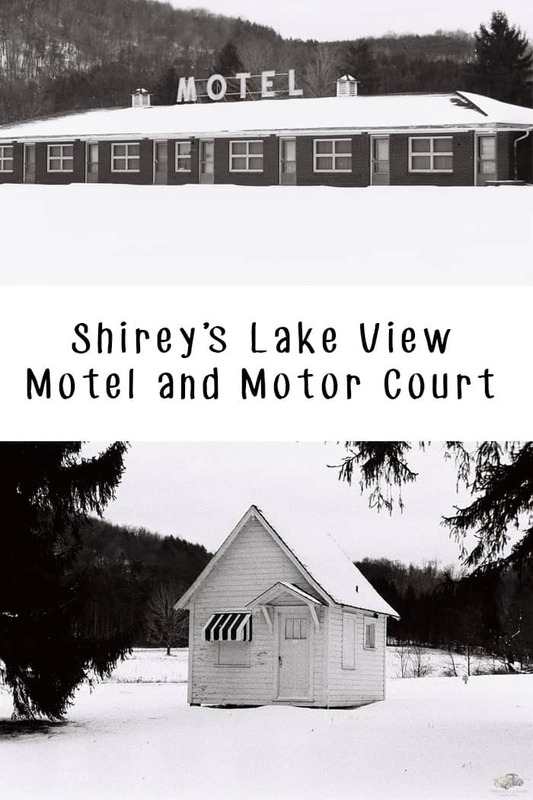 For me, one of those places that time is slowly forgetting is Shirey’s Motel, also known as Shirey Lake View Motor Court. Located just outside of Ligonier, this motel was a collection of single room cottages with a small strip motel in the center. These motor courts were popular in the heyday of the Lincoln Highway. 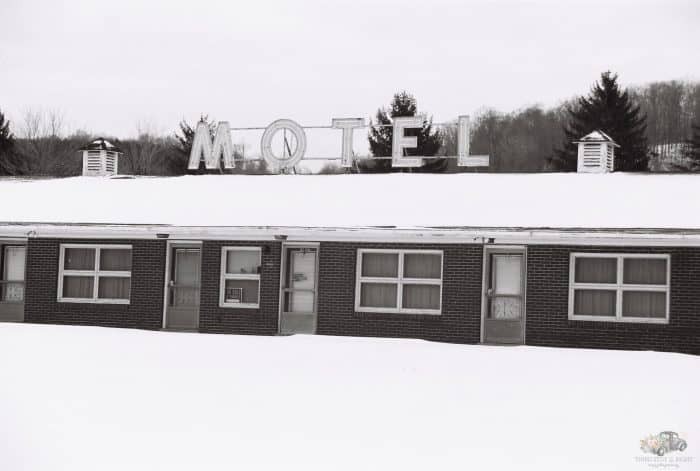 In fact, the Ligonier-area had several of these motor courts including the ABC Motel in addition to Shirey’s Motel. The Shireys had been farming on their land since the farm was bought in 1917. In addition to the successful farm business, the family also decided to start offering rooms for rent. 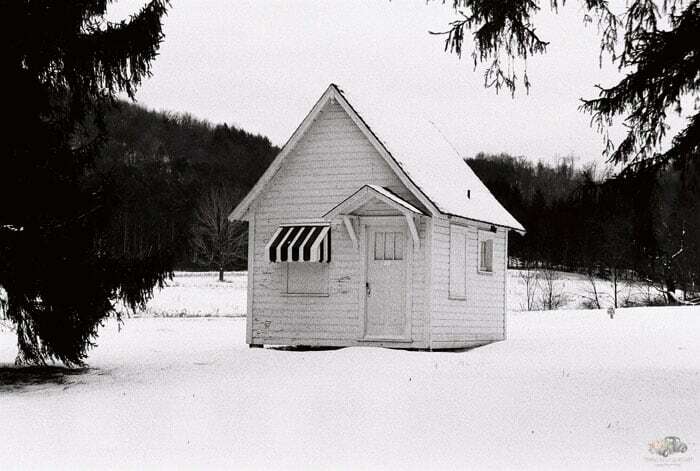 In 1937 the first set of ten cabins was built, followed by an addition 10 in 1939 brining the total to 20 cabins. Since the original cabins lacked an office, travelers would drive up to the farm house and honk the horn in order to rent a room for the night. The addition of a small motel in 1957 alleviated the need to stop at the farmhouse. Shirey’s Motel was called Lake View since it overlooked an ice lake formerly used to carve and store ice blocks over a century ago. When the ice company closed in 1920, the property was used as a private home and most recently Lady of the Lake bed and breakfast — hence, “lake view”. Unfortunately, the development of the Pennsylvania Turnpike hurt businesses along the Lincoln Highway. Travelers were opting for the faster turnpike instead of taking the more scenic Lincoln Highway. Shirey Motel’s tourist cabins lasted until 1988 when the cabins closed. After the closing of the cabins, the individual cabs were sold and one-by-one removed from the property. After the closing of the cabins, the brick motel was able to stay in business for another six years before closing permanently in 1994. I remember traveling along Route 30 with my parents and being fascinated by the Shirey’s tiny cabins — they reminded me of dollhouses. I was so sad as they started to disappear. 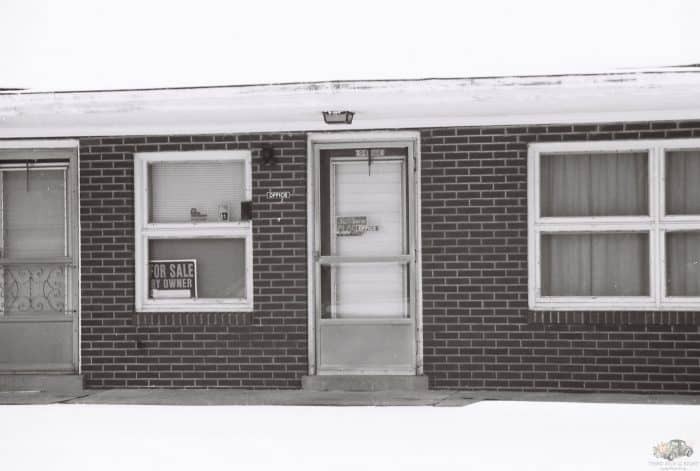 Sometime around 2001 or 2002 I went out to the motel in order to get some pictures. 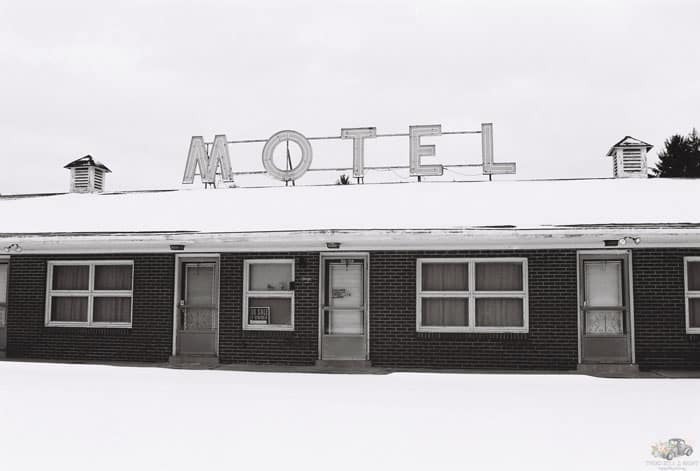 Deep down I knew that the motel would never reopen and would eventually be demolished. 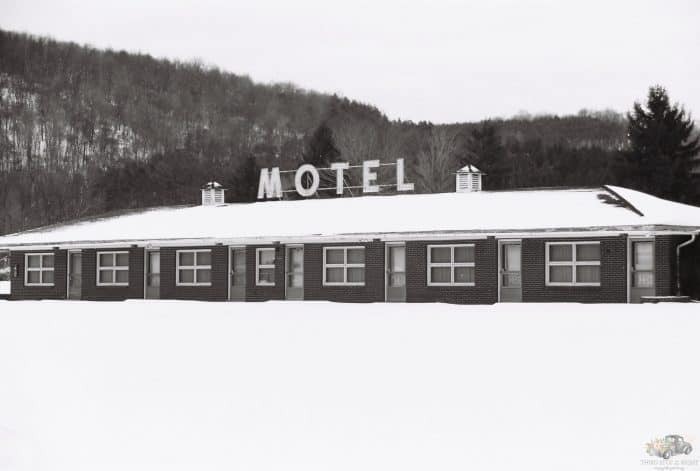 It had recently snowed and the snow was undisturbed at the old motel. I spent some time just walking around, taking everything in. There was one tourist cabin left. I took all of the pictures in black and white, which I now regret. I wish I had color versions, but back then you were stuck with whatever you loaded your camera with. 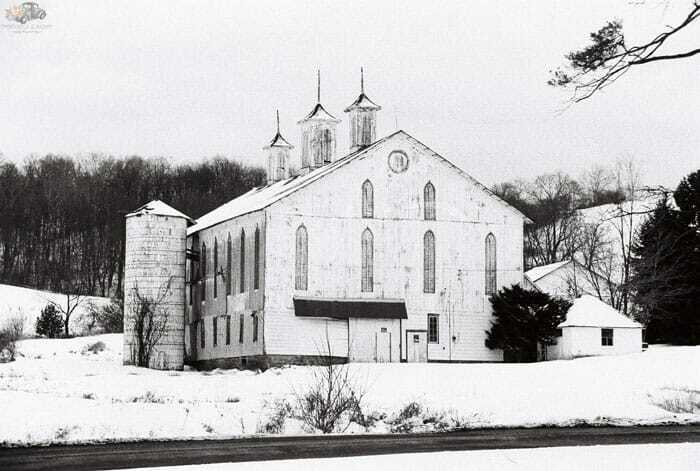 I’m not sure what year the brick motel was torn down, but eventually the property was purchased by Missy’s Place Foundation under the direction of Gregory Podlucky who wanted to build a church on the property. The church never happened and Podlucky eventually went to jail for fraud and embezzlement. Not much is left of the property to indicate it’s past life. The farmhouse and antique barn still exist and are in good condition. Next door, however, behind the former Colonial Inn are two remaining cabins that were very similar to the ones that had been at Shirey’s. If you take old Lincoln Highway you will be able to get a good view of the cabins. 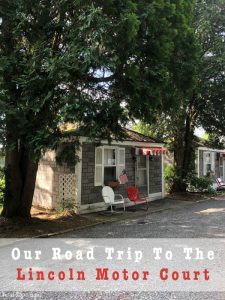 Spend the night in an authentic tourist cabin along the Lincoln Highway. 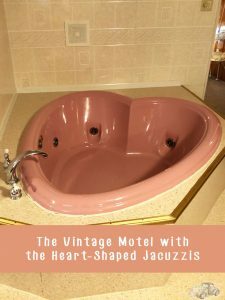 Although these tourist courts are quickly disappearing, if you are ever in the Western Pennsylvania area you have to check out the Lincoln Motor Court. This motor court is an actual operating motor court where you can step back in time and spend the night in one of their adorable tourist cabins.